The strategic role of the Media in national development was brought to the fore on the second edition of Open Forum on Agricultural Biotechnology (OFAB) media award ceremony at Sheraton Hotels Abuja, on Wednesday, August 1, 2018. It was a special occasion which recognised excellence in reportage by the Nigeria media and the need to properly honour them. Prioritizing the innovation in science and technology to fast track development in the country was the scientist’s request from the journalist. The aim for the OFAB media award is to reward media reportage of scientific and agricultural innovations especially as regards changing the orientation of farmers to embrace genetically modified technology. In her welcome remarks, Dr. Rose Gidado, Country Coordinator, OFAB Nigeria, said, ‘’Today, we are celebrating the contributions of distinguished media practitioners for our advocacy and sensitization efforts that we have made for the past 9 years. It is giving honour to whom honour is due. Dr. Gidado stressed that biotechnology has become the cornerstone responsible for bumper harvests and self-sufficiency in quality food production, adding that Nigeria must not be left behind. Gidado noted that farming can only become attractive and meaningful if science and technology are deployed in agriculture. 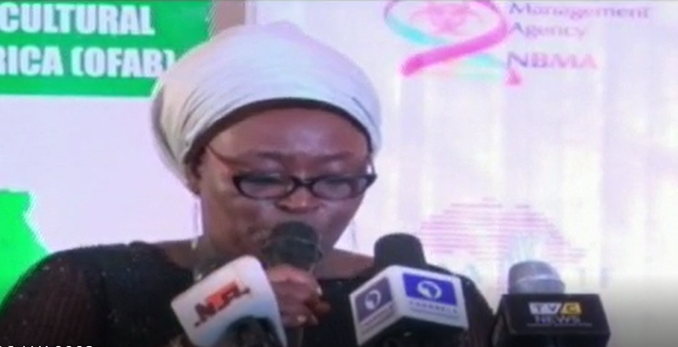 She said that Nigeria’s successful release of two genetically modified cotton varieties has registered Nigeria’s name among the comity of nations. She added that this achievement confirmed the determination of Nigerian scientists to create a new lease of life to farmers, regardless of the criticisms from those who know nothing about the technology. She, therefore, urged journalists to stand with science in their reportage. ‘’Don’t balance scientific facts with unscientific lies. “Science is a body of knowledge, a collection of facts, and a provider of solutions. It is evidenced-based. So, it should not be politicised” she concluded. In his remarks, the President of the National Biosafety and Biotechnology Consortium (NBBC), Prof. Celestine Aguoru, stated that NBBC is happy with OFAB Nigeria, for recognizing the media practitioners who have dedicated time and space to bring the correct information on biotechnology and biosafety to Nigerians. He described the media as the soul of the society with the duty to expose the hypocrisy of the anti-GM group who have no knowledge of modern biotechnology but speak for their pecuniary interest. ‘’These group of people who have no knowledge of biotechnology insult Nigerians saying we have no expertise. It’s really very unfortunate that Nigerians could sabotage their country to this extent’’. He also said that ‘’This century and the ones ahead are knowledge driven and any person standing in the way of Nigeria not to benefit by utilizing Nigerian experts must be considered a saboteur and therefore an enemy of the country and should be so exposed by the media. I congratulate all those who are receiving award today. I urge the media to show more interest in modern biotechnology and biosafety reportage’’, he concluded. Mr. Bitrus Bako Nabasu who represented the Minister of Federal Ministry of Science and Technology thus stated ‘’Today brings to mind the strategic role the media plays in our national development and the need to properly honour them whenever the occasion presents itself’’. We are more than convinced that we have an ally in you in our quest at promoting Science, Technology Innovation (STI), in the country’’. He said that our primitive agricultural practices are facing various challenges and from what we are seeing all over the world, STI hold the key to overcoming these challenges. He confirmed that the Federal Government has recognised this; hence the recent decision to increase funding for research and development in the country. ‘’As a country, we must encourage our Scientist to continue to work for the good of the country and the people’’ he noted. He further revealed government’s determination to make STI the hub on which the wheel of development revolves, thus, the establishment of the NABDA over 2 decades ago to prepare the ground for the deployment of modern biotechnology in all sectors of the economy. He related the application of STI in health, environment, industry and agriculture as a testimony of government’s deliberate efforts to use science and technology to boost food production, ensure affordable healthcare delivery system, make available industrial raw materials and establish a sustainable environment in the country.‘’ These institutes must be encouraged to carry out their mandates in order to ensure that the country attains food sufficiency in food production. Our farmers need to be adequately sensitized on the research and development results of our scientists in the institutes. This can only be done when you, the members of the press carry it out to the nook and cranny of the country. The coming together of Scientists and Journalists is crucial at fast tracking our national development. We urge you to make use of this synergy for the development of our nation. While the Scientists are churning out Research and Development result, the Journalist should be there to carry the result to the populace by way of sensitization’’ he emphasized. The minister extended the hand of fellowship to the media, noting that their role as society watch-dogs is recognised by the constitution. He urged them to work with our Scientist to ensure that Government emphasis on the need to use Science, Technology and Innovation as the bedrock of our innovation is attained. We have competent Scientists who are competing favourably with their counterparts from other parts of the world and Journalists need to support and work with them to enhance their research and propel development. ‘’Jointly we can work together and make Nigeria greater’. Prof. Alex Akpan, acting Director General/CEO, National Biotechnology Development Agency stated that unless Nigeria adopts modern agricultural technology, the nation’s quest for food sufficiency cannot be achieved. Speaking at the award ceremony, Akpa explained that it was organised to celebrate our colleagues in the media who deserves accolades in the coverage of modern biotechnology in the past one year. He described the media as a very vibrant sector and underlined the importance of the press. Prof. Akpa lamented that some people have been parading themselves as scientists and engage in criticising every move designed by the government to enhance the agricultural sector and bring about self-sufficiency in food production. He, however, expressed joy over the release of the first home-grown genetically modified crop, Bt. Cotton in the country and tasked the media practitioners to work assiduously in creating awareness and sensitisation to the public to ensure that the technology was successfully deployed in the agricultural sector. He revealed that, “Other countries of the world have moved on to more advanced forms of modern technology, including gene editing, but here in Nigeria, we are still debating genetic modification, a technology that is over 25 years old. He stressed that, “We cannot re-invent the wheel. We have to move with time. The era of hoe and cutlass farming is over, and that is the reality the media need to educate Nigerians on. “My message for the media tonight is: Go tell Nigerians, we cannot achieve food security and sufficiency without modern technology’’. In his own remarks, Dr. Rufus Ebegba, the Director General/CEO of National Biosafety Management Agency (NBMA), noted that the night was to celebrate the media. According to him, we would all have been in the dark but for the critical role of the media. He thanked the media for hyping the activities of NBMA and reassured them that the Agency is happy with them for the service they are doing to the nation. He advised them to report what is true as they use their pen. Dr. Ebegba also noted that although biotechnology will continue to receive criticism, the media should work harder as stake holders to promote the technology. He made clarifications on the various roles of the two Agencies. ‘’Don’t confuse NABDA with NBMA. NABDA promote while NBMA regulate’’ he cautioned. NBMA is saddled with the responsibility to ensure that the activities of NABDA are safe to humanity and the environment and we will not be compromised in playing our role he stressed. NBMA do not defend technology, we defend safety’’, he concluded. Dr. Abdourhamane Issoufou Kollo, Regional Director, African Agricuitural Technology Foundation (AATF)confirmed that the working process in Nigeria has been very collaborative and assured that AATF shall continue to defend OFAB in the way it knows. He also hinted that the dossier for the release of the cowpea is in the pipeline and encouraged OFAB to do more. Dr. Ishiak Khali, who represented the Director General, National Agricultural Seed Council appreciated OFAB Nigeria, for the partnership in promoting the adoption of not only GM, but also the conventional crops. ‘’I also commend OFAB for appreciating the media for their role of educating, informing both the pro and anti- GMO. He said that, ‘’what is important in science invention is that it encourages food security and sustainable development but it takes time to convince people, especially on the safety issue’’. Prof. E.S. Dandaura Dan Dara, Executive Secretary, Institute of Strategic and Development communication (ISDEVCOM), Nasarawa State University, Keffi (NSUK), in his Keynote address titled; Science Journalism – a Panacea for Effective Commercialization of Scientific Research, underscored the importance of the 3Cs: Connect, Communicate and Collaborate media relation and emphasised on the need for synergy between the Scientists and the Media in supplying the necessary information to the public. He noted that Journalists are bridge builders between Scientists and the community and urged them to take radical steps in delivering research contents. There were further remarks from other representatives of different Institutions and other organisations. They include; Prof. I.U. Abubakar, Executive Director, IAR, Zaria, who commended OFAB for pushing biotechnology in Nigeria to ensure food security. Arc. Kabir Ibrahim, President, All Farmers Association (AFA) commended the media for being equal to the task and charged them to be bold and courageous in communicating the right information. Prioritizing the innovation in science and technology to fast track development in the country was the scientist’s request from the journalist. The programme was well attended and the media was present to cheer their own. The overall winner, Mr. Musa Baba Aliyu of NTA, in his acceptance speech said that he is encouraged to do more especially in covering Agriculture. He shall be representing Nigeria in the African contest later this year in Burkina Faso. 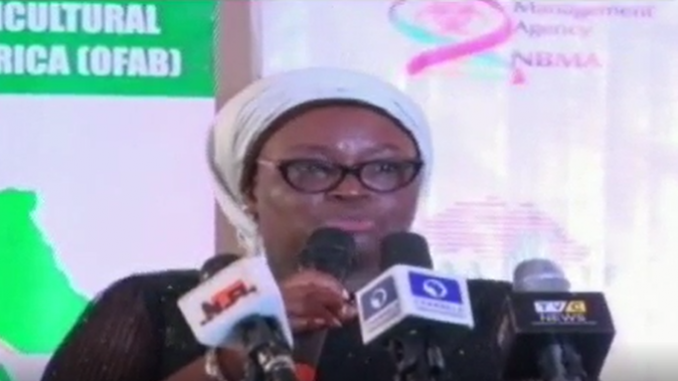 Edel-Quinn Agbaegbu is the Executive Director of Every Woman Hope Centre (EWHC), an Abuja based Non-Governmental Organisation and the Secretary of National Biosafety and Biotechnology Consortium (NBBC).